I’m going to be selling and signing books on July 27. 10 a.m. – 4 p.m. at Joe’s Town (12236 S. 71 Highway Grandview, MO 64030) On top of that, it’s all part of an art show, so there will be plenty of authors to meet as well as other artists. So if you live within driving distance, feel free to come on out! I’d love to meet more followers, writers, etc. I haven’t done a book signing since 2007, so I’m very excited for this opportunity, and I can’t wait to meet more wonderful artists! This photo on the right is my first day of kindergarden in Green Bay, Wisconsin. I wanted to share it, because it’s another form of inspiration for me. Although the day was important, I think the photo said a lot. 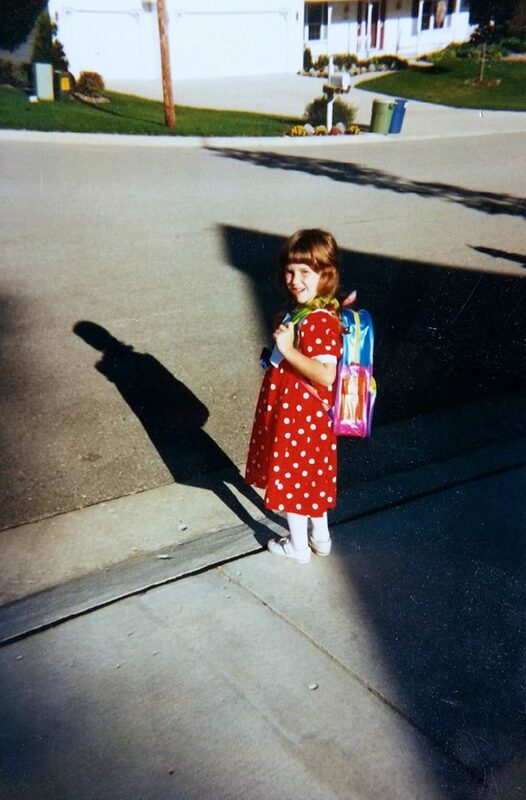 To me, my shadow looks like a grownup, despite my young age, and I think the irony in my age and the shadows age on a day where I was beginning school is simply delightful. It’s one of those things I find to be like a little artistic secret from life. It was as if the future saw me before I did, so I keep this photo around to remind me of my goals and the future. And if you want a copy of Minutes Before Sunset beforehand, it’s available on Amazon, Barnes & Noble, Smashwords, Kobo, Diesel, Sony, and Apple. I wish I could be there 😦 How very exciting! I hope you have a wonderful experience! Have a great time Shannon! Wishing you the very best! Congrats on your signing. I hope you feel better. I’ve been under the weather myself, so I feel for you! Thank you! I am all better today 😀 Hope you feel better soon too! There is nothing like a book signing, especially if you end up with writer’s cramp. Love the pic, the writer’s shadow looking to the future. A writer’s cramp at a book signing would be a lovely “problem” to have 😀 I’m glad you liked the picture.